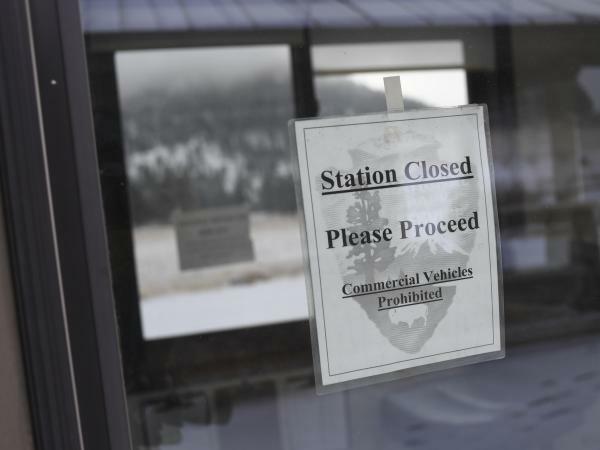 A pay station at Rocky Mountain National Park is closed on Thursday in Estes Park, Colo. Many parks remain open but unstaffed during the partial shutdown of the federal government. Many of the United States' national parks remain open to visitors during the partial government shutdown. But if you go, be prepared – you're probably on your own in there. "There has been a lapse in federal appropriations. "During the government shutdown, Big Bend National Park will remain open 24 hours a day, seven days a week, as always. "However, we regret that there will be NO visitor services provided." The park adds: "Emergency services remain available, but response times may be delayed." So while visitors can in many cases avoid paying admission fees, this is no time to go breaking a leg. Some lodges and shops operated by commercial entities remain open in some parks. Elsewhere, some state governments and tourism boards have been using their own funds to keep the parks open during the busy vacation week between Christmas and New Year's Day. But as the shutdown heads into a second week with no clear end in sight, many of those funds may be about to dry up. In Utah, the state has provided funding to keep open the visitors centers at Bryce Canyon, Zion and Arches national parks through Dec. 31. After that, the parks will be open, but the visitors centers closed. "We don't like having to do it, and the federal government should be doing it," Gov. Gary Herbert of Utah told The New York Times. "We're frustrated — we're probably beyond frustrated, maybe even angry — but we're prepared." Arizona's state government donated a bit more than $64,000 to keep some services at the Grand Canyon operating for the first seven days of the shutdown. That money has been funding trash collection, bathroom cleaning, and snow removal on trails and sidewalks. New York State is paying the federal government $65,000 a day to keep open the Statue of Liberty National Monument and Ellis Island, which receive an average of 12,000 visitors a day. "Glad so many people are visiting these two symbols of hope and freedom. New York State will keep these parks open until the #TrumpShutdown ends," New York Gov. Andrew Cuomo tweeted on Thursday. In Philadelphia, the Liberty Bell and Independence Hall are open Friday, Saturday, and Sunday, thanks to $32,000 in funding from Visit Philadelphia, The Inquirer reported. Many attractions in Washington, D.C., have remained open since the shutdown, getting by on leftover funds. But that money is nearly gone, and on Jan. 2, the museums that are part of the Smithsonian Institution will close, as will the National Zoo. But elsewhere, the shutdown has spelled something of a free-for-all. The Los Angeles Times reports that at Joshua Tree National Park, which is open but unstaffed, local do-gooders have been emptying trash cans, scrubbing toilets, and restocking toilet paper – all of their own volition. The Times reports that one of those volunteers, Rand Abbott, is a 54-year-old rock climber, Marine Corps veteran, and paraplegic. Abbott said he has been handing out trash bags to people and resupplying toilet paper to park bathrooms – but it's tough going: "Seventy percent of the people I'm running into are extremely rude," he told the newspaper. "Yesterday, I had my life threatened two times. It's crazy in there right now." It's a good idea to check a park's website before you go. But the National Park Service warns that park websites and social media accounts may not be up to date — due, of course, to the shutdown.